Hillary Clinton talks TPP: The best sign yet that she’ll have to take Bernie Sanders’ campaign seriously. 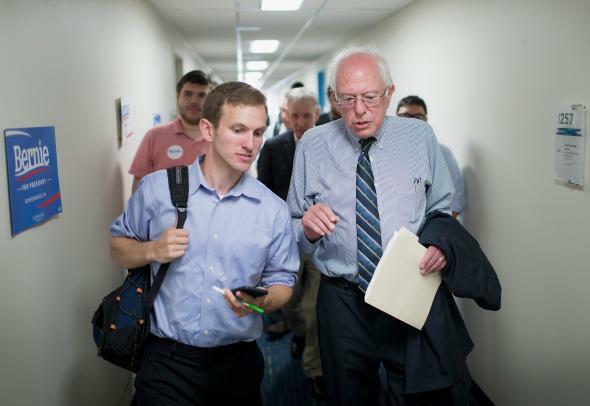 Vermont Sen. Bernie Sanders, right, chats with a reporter during a visit to his Iowa campaign headquarters on June 13, 2015, in Des Moines. MARSHALLTOWN, Iowa—More than 200 people packed into a musty, walk-in basement of a local union hall here on Saturday afternoon to hear Bernie Sanders. About halfway through the self-styled socialist’s rousing-if-somewhat-rambling remarks, he took a direct shot at President Obama and a not-so-subtle one at Hillary Clinton. “The time is long overdue for us to begin discussing our disastrous trade policies,” Sanders told the standing-room-only crowd, a failing microphone making his scratchy voice even more so as he railed against the Trans-Pacific Partnership, the global trade accord that has pitted American labor and liberal activists against the president. It wasn’t the full-throated opposition that labor leaders and their progressive allies wanted, but her comments were noteworthy nonetheless. For starters, Clinton’s support of Pelosi’s hardball tactics should further strengthen House Democrats’ hand in negotiations on Capitol Hill for stronger protections for American workers. More important is what the comments suggest for the campaign trail ahead. Clinton was careful and calculated—but this was the first time she has been forced into a major debate she doesn’t want to have by one of her long-shot challengers from the left. As I have noted before, Clinton has already moved left further and faster than most campaign observers had expected. But her leftward shifts on criminal justice, immigration, and other issues were largely by political choice, not by force. Those were examples of Clinton surveying the electorate—both in the Democratic primary and the general election—and charting a path to its center. While most of her chosen causes are progressive in nature, they also poll relatively well across the political spectrum. She wasn’t being pushed leftward; she went there willingly with an eye on 2016. That’s not what’s happening in the trade debate. Clinton would prefer to sit this one out entirely if she could. The fact that she’s not tells us something about the growing importance of Sanders’ insurgent campaign. The Vermont senator may never seriously challenge her for the Democratic nomination, but it’s now clear that he can challenge her on the trail. Making matters awkward for Clinton’s current attempt to have it both ways is that she has historically backed most free-trade efforts. As first lady she trumpeted the North American Free Trade Agreement, which her husband singed into law in his first year in office, and as secretary of state, she called the Trans-Pacific Partnership the “gold standard in trade agreements.” This year, however, she’s attempted to put some distance between herself and her past, with aides suggesting repeatedly she’d take a wait-and-see approach on the deal’s specifics. Trade is an issue about which the political calculation is difficult to make, in no small part because voters don’t seem to know what they think about the topic. Americans generally support free trade, at least in the abstract, with Democrats slightly more likely to do so than Republicans, according to a recent Pew survey. When it comes to specific deals, though, voters are either largely uninformed, uninterested, or both. In a New York Times/CBS poll taken last month, for example, nearly 8 in 10 Americans said they either knew “not much” or “nothing at all” about the TPP deal. (Opinions were only slightly stronger on trade deals that already exist: In the same poll, 63 percent of respondents said they didn’t know enough about NAFTA to have an opinion on it.) Making matters even more complicated for a politician trying to figure out which way the wind is blowing is the fact that it is congressional GOP leaders who are the ones working hand in hand with Obama on fast-track legislation, which would force lawmakers to take an up-or-down vote on any deal the president ultimately negotiated in Asia. Sanders, who has never shown much interest in political winds, isn’t the only one putting pressure on Clinton to get off the sidelines and pick a side. Fellow 2016 hopeful Martin O’Malley is also trying to make the trade deal a campaign issue, and Elizabeth Warren has likewise been loud and clear about her opposition. Labor unions fought for months to bring House Democrats around to their side, threatening to withhold money and primary lawmakers who are typically their allies. But it’s Sanders’ current position as the darling of the left that made Clinton’s previous silence ultimately untenable on the campaign trail. “Is she for it? Is she against it?” Sanders asked reporters Sunday after Clinton had finally dipped a toe into the debate. “Those are your two options.” The long-shot progressive candidate doesn’t yet have the political clout to force Clinton to answer his questions definitely. But for the first time it’s now imaginable that he may before the nominating contest comes to an end.